This post solves particular use case with skype not working on Ubuntu 15.04 with AMD as the graphics card. I was having problem with skype not opening and I quickly figured out that there was some issue with finding shared object file. $ find /usr/ -name "libGL.so.1"
This post is a write-up of my attempt to keep local scene safe and secure and make institutions, programmers and digital users aware about security. Today, at 1:00 PM, I got a call from a very talented NJ Subedi who told me that some guy told him that the guy could change all his scores and would be able to get him admitted to Kathmandu University even without appearing on the exam. WTH! I told myself. I was working on one of my projects so at first, I did not think of trying to attack the admission app. But, I could not resist my curiosity and soon began some basic recon. I started smelling bad things when I found that MariaDB port 3306 was open to the world and anybody could access the database server given the credentials. I knew of an authentication bypass bug in MySQL/MariaDB. 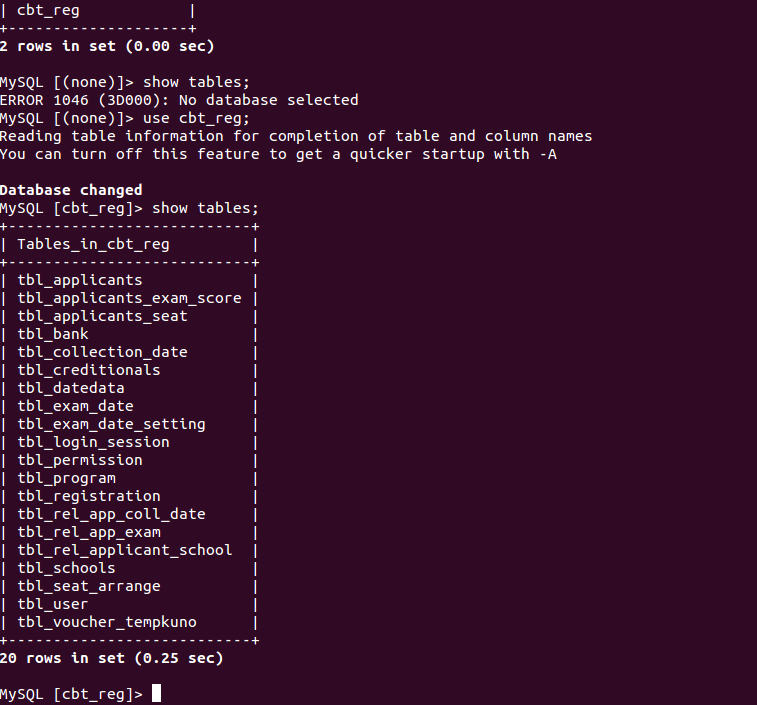 But, it was for older versions of database server so after a quick test, I ruled out this exploit. SSH port was also open to the world and SSH bruteforcing is still common. I don't know if a weak password has been chosen for one of the accounts in the system but I ruled out this possibility believing that there had to be something else: some kind of coding flaw or deployment issue. I then switched to the terminal and got access to the MariaDB server. Within half an hour, I was already in the database. As a proof, I've attached 'show tables' output. No further queries were executed. Filter port 3306 and 22 for limited trusted IPs only (Though I didn't bruteforce MariaDB or SSHD, it can also be an issue). That was quickly fixed. Wish all the applicants good luck. It was also quickly fixed. Thanks for working hard on keeping applicants safe. To move forward, you need to backup. Backing up your production data is critical and with Postgresql, you can backup WAL (Write Ahead Log) archives and this post gives you steps to accomplish for backing up postgresql WALs to Amazon S3 on your OpenShift Origin using WAL-E.
WAL-E is a great tool that simplifies backup of postgresql by performing continuous archiving of PostgreSQL WAL files and base backups. Enough blabbering, you can reach out technical docs on how WAL works. I'll just mention series of commands and steps necessary for sending WAL archives to AWS S3 bucket. Then, edit the postgresql configuration file so as to turn on wal archiving. You need to find the right container for your postgresql in /var/lib/openshift (Its quite trivial if you know OpenShift basics). Finally, you need to ensure that you are taking base backups periodically which can be achieved by utilizing cron cartridge. Clone the repo, add the following file and push to the application. $ git commit -m "Added pg cron script"
Make sure you use the OPENSHIFT_POSTGRESQL_DIR env-var or some other env-var that does not have two forward slashes adjacently since WAL-E hates it. This should help you keep your data backed up regularly and you can enjoy beers. Openshift is an awesome technology and have fell in love with it recently. In this post, I will talk about how we can set JVM Heap Size for your application using Jboss cartridge. If you look into the content of the standalone.conf located at $OPENSHIFT_JBOSSEAP_DIR/bin, you can see that JVM_HEAP_RATIO is set to 0.5 if it is not already set. And, later this ratio is used to calculate the max_heap so as to inject the maximum heap size in jboss java process. You can see how gear memory size is used to calculate the value of heap size. This is the very reason why the default installation allocates half of total gear memory size. Alternatively, rhc set-env JVM_HEAP_RATIO=0.7 -a appName should also work but I have not tried it. Recently the heartbleed bug was exposed which existed in all the services that used OpenSSL 1.0.1 through 1.0.1f (inclusive) for years already. This weakness allows stealing the information protected, under normal conditions, by the SSL/TLS encryption used to secure the Internet by reading the memory of the system without need of any kind of access. I've been administering OpenShift applications recently and this post outlines the measures I took to secure the OpenShift applications from this critical vulnerability. Alternatively, you can use one of the online tools or the offline python tool to check if you are vulnerable or not. Note that in case of OpenShift origin, you will have to update the OpenSSL package in brokers and nodes such that all the OpenShift apps are secure. We'll have to restart the proxy systems (node-proxy) for the nodes for the effect of the patch. In fact, we will have to restart all the services that use the vulnerable OpenSSL versions. Since I could not find the rpm in the repo, here is the quick How To to install HTTrack website copier on CentOS.